Chicago’s Chinatown is one of the oldest in the United States. Chinese people came to the Midwestern city after escaping from increasingly high racial tensions in California around 1870. Present-day Chinatown was established in 1915 after people moved south from the Loop. From 1915 to now, the Chinese community built a strong community in the neighborhood. 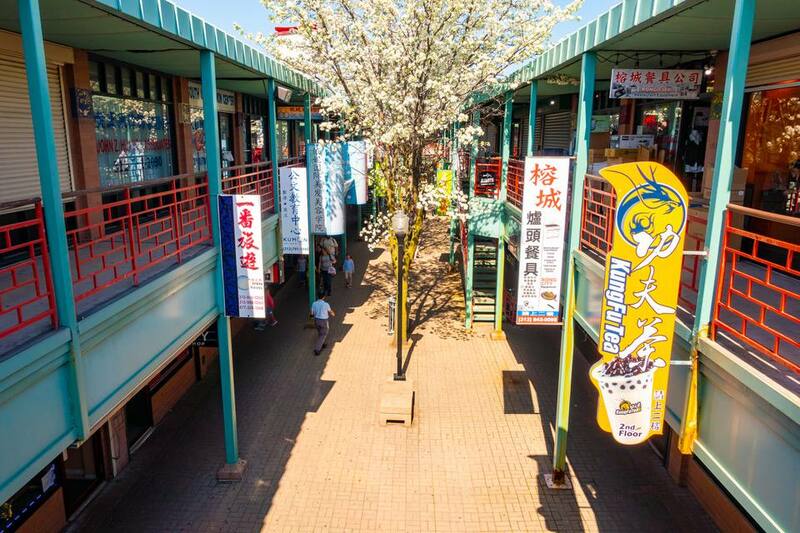 Chinatown is flush with colorful shops, restaurants, medicine shops, markets, murals and more. While there are so many options, here are our top choices of what to do while you’re in Chinatown. Learn all about the history of Chinese-Americans in the Midwest at the Chinese American Museum of Chicago. The museum is housed in the former home of the Quong Yick Co. grocery store. There are visiting exhibitions but one of permanent fixtures is “Great Wall to Great Lakes: Chinese Immigration to the Midwest,” where visitors can read and hear about the journeys Chinese people took from California to the Midwest and beyond. Admission is pay-what-you-wish, but the suggestion for adults is $5 and $3 for students and seniors. This 17-acre park used to be a railyard but was converted into a much-needed green space by the Chicago Park District starting in 1998. Named after the noted civic leader and lifelong Chinatown resident, Ping Tom Memorial Park and fieldhouse has a fitness center, indoor pool, patio, pagoda and more all with views of the Chicago river. One of the standout events is the annual dragon boat race in June where teams can race each other on the river. A nine-dragon wall has just that, nine dragons, etched onto its surface. These walls are usually found in Chinese palaces and gardens — Chicago’s nine-dragon wall is a miniature reproduction of the wall in Behai Park, Beijing, but it’s still a sight to behold. The green and gold structure is right by the L tracks and a small placard will tell you more about the wall’s history. There are a variety of shops to visit throughout the entire neighborhood but the main commercial artery is Wentworth Avenue. Start on Cermak Street under the Chinatown Gate that welcomes you to the neighborhood. As you walk down the street there will be colorful souvenir shops, restaurants and the beautifully ornate Pui Tak Center. If you’re itching to grab a gift for people back home, or for yourself, be sure to stop in Chinatown Bazaar. Before you leave Wentworth it’s also worthwhile to visit a bakery to get some Chinese pastries. Hoi polloi is a derogatory term meaning the masses, or the working class, but Hoypoloi Gallery is embracing the term and uses the gallery to make art more accessible by offering uncommon art to the common person. Hoypoloi has three locations, two gift shops in the O’Hare International Airport and one more traditional gallery in Chinatown. They sell everything from paintings to sculptures to jewelry and everything has a one-of-a-kind feel. Even if the prices are beyond what you can afford, it’s an experience to look at the art and chat with the very knowledgeable owner. If you or someone you know is an herbalist, then you’ll love Yin Wall City. The store is chock-full of dried goods, herbs, teas as well as roots like ginseng or ginger. Shopping at Yin Wall City is an adventure as the signage is all in chinese and the store’s employees don’t speak much English. Unless you’re just looking to browse bring a few pictures of your desired herb with you, or write down the name in Mandarin to make sure you buy the right thing. Prices may seem steep (going as high $700 a pound for some ginsengs!) but remember that you’ll only need a small fraction of that amount. Qing Xiang Yuan Dumplings has been serving freshly-made dumplings since 2014. Enjoy a plate of expertly prepared lamb and coriander dumplings served on custom porcelain plates from China’s Porcelain Capital, Jingdezhen. QXY sells dumplings stuffed with every protein imaginable and the vegetarian dumplings are also vegan friendly. The dumplings are made using fresh, organic ingredients and are prepared every morning at 6 a.m. Round out your meal with a pot of Chinese tea and an appetizer or two. If you find yourself craving more of the dumplings, you can also buy them uncooked, just place an order online at least one day in advance to schedule a pick up time. QXY also offers free dumpling classes, all you need to do is register in advance online. Head underground to the basement karaoke haven that is Sakura Karaoke Bar. You can sing in front of an audience in the lounge or you can rent one of eight private rooms to belt songs with your friends. Sakura has a song list of 100,000 Western and Eastern songs along with a bar offering more than 20 cocktails. If you get hungry, Sakura also has a kitchen making delicious American and Asian food. Guests under 21 are allowed entry, but they have to leave by 10 p.m. and those under 18 must be accompanied by an adult. Sakura’s karaoke prices start at $25 per person to sing in the lounge and $35 per hour (with a 2 hour minimum) for private rooms.